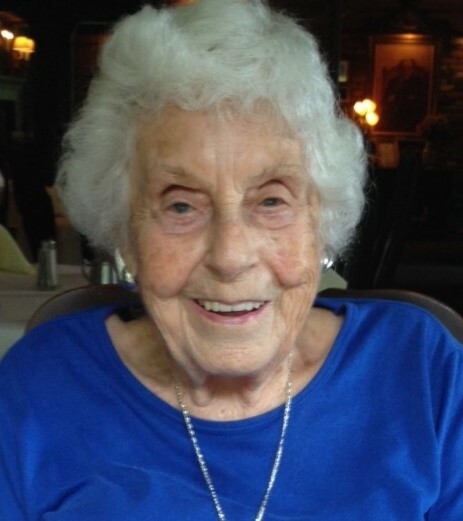 Lucy Rutherford Morris passed away peacefully on March 9, 2019 at Queen Anne Nursing Home in Hingham at the age of 100. Former resident of Dunellen NJ, Wayne NJ, Wyckoff NJ and Scituate, MA. Born on September 11, 1918 in Woodhaven, NY to Edwin James Rutherford and Irene Snyder Rutherford. Beloved wife of the late John Barton Morris. Loving mother of Peter Apgar and wife Phyllis of Poulsbo, WA; Susan Sulc of Norwell, MA; Mary Gleason of Chatsworth, CA and the late Andrew Morris of CT. Adoring grandmother of Andrew Apgar, Jeffrey Apgar, Kevin Apgar, Heather Vitzthum, Gretchen Holewinski, Derek Sulc, Kathryn Stafford, Christopher Gleason, Amy Celep, Joshua Morris, Wendy Chambers, and the late Robert Morris. Lucy was predeceased by her brother Edwin Snyder Rutherford, and sisters Mary Jean Lupo and Phyllis Ann Van Nest. She is also survived by twenty-six great-grandchildren and three-great-great-grandchildren. Lucy studied voice and languages in New York City as a teenager and later continued her love of music singing professionally at Crescent Avenue Presbyterian Church in Plainfield, NJ. As a young mother, she worked as an executive secretary at Ortho Pharmaceutical in Sommerville, NJ. After moving to Wyckoff, NJ she worked as a Homemaker in Bergen County to help those who needed assistance with activities of daily living. There was always a special place in Lucy’s heart for those in need, and she gave generously to many causes. She was especially interested in organizations that promoted conservation, education, healthcare, and social justice. Her deep Christian faith sustained her and gave her strength throughout her life. Along with her husband, she helped found Children’s Haven, a home for foster youth in Paterson, NJ. They both served on the Board of Directors for many years. As a volunteer with Wayne Interfaith Network (WIN), she managed the Packanack Lake Community Church food pantry. Lucy was a devoted wife, mother and grandmother who enjoyed reading, traveling, music, and playing bridge. She loved the outdoors and found contentment by the beach. Lucy and her husband spent many happy summers on Martha’s Vineyard, where they would host their children and grandchildren. Lucy’s family was her biggest joy. They were blessed to have had so much time with her and to hear the many stories she loved to tell. Her ready wit, kindness, devotion, and bright smile will be missed. Friends and family are invited to celebrate Lucy at a Memorial Service on March 30th at 3pm at Harbor United Methodist Church, 55 First Parish Road, Scituate, MA. Interment was privately held at Hillside Cemetery in Scotch Plains, New Jersey earlier this month. In lieu of flowers, donations in memory of Lucy may be made to the Norwell VNA and Hospice (https://nvna.org/) or Suicide Prevention Hotline (https://suicidepreventionlifeline.org/donate/).